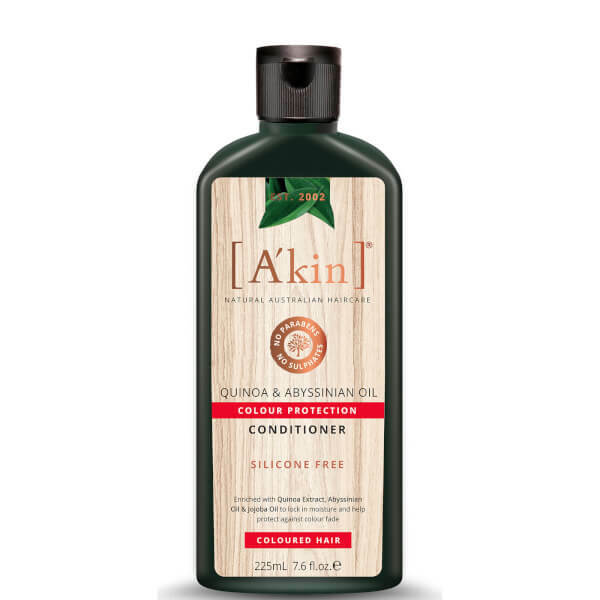 Treat coloured hair to the benefits of A'Kin Colour Protection Quinoa & Abyssinian Oil Conditioner; a weightless formula that works to nourish and restore radiance from root to tip. Fortified with Quinoa Extract, the luxurious conditioner strengthens and hydrates hair, whilst a dose of Abyssinian Oil delivers salon-worthy shine to dull, lack-lustre locks. Expect soft, healthy tresses with enhanced colour vibrancy and luminosity. After shampooing, massage a generous amount into wet hair and scalp. Rinse thoroughly. Aqua (Water), Crambe Abyssinica Seed Oil Phytosterol Esters*, Cetearyl Alcohol*, Glycerin*, Behentrimonium Methosulfate*, Hydrolysed Quinoa*, Lecithin*, Glyceryl Laurate*, Sodium Gluconate*, Citric Acid*, Citrus Aurantium Dulcis (Orange) Oil*, Arginine*, Cananga Odorata (Ylang) Flower Oil*, Rosmarinus Officinalis (Rosemary) Leaf Extract*, Elettaria Cardamomum Seed Oil*, Eugenia Caryophyllus (Clove) Leaf Oil*, Potassium Sorbate, Limonene^. *From botanical source. ^Natural component of essential oil.